As from 2012 we will be teaching some of our projects as web classes. Below is a proposed time table, if you are interested in learning one of our projects and it does not appear below please contact us and we may be able to include it. You will be asked to join a Yahoo Group, this is were you will be able to download your instructions in a PDF format, all instructions are detailed, with lots of step by step diagrams and photos.&nbsp; There will be a chat room for the students,because not all students are logged on at one time, this works more as a message board and the Tutor will check the board once a day and answer all your questions. You will also be able to upload photos of your work as you progress for the Tutor and other students to see. Classes will run for 8 weeks with new instructions uploaded at 2 weekly intervals, this allows for students to work at their own pace and not feel rushed. Tuition fees for all classes are $50.00Aust, all kits are extra, prices for kits do not include postage which will vary depending on destination if you email us we will be able to quote you a price. Payments are via PayPal, and for Australia only visa or Master cards or Direct deposit to our account, please do NOT send card details via email, send us your phone number and we will contact you. Requirements are listed with the description of the individual class, I have shown a price for a kit for the class and what is included, or you can buy individual items as needed. Myreska is a Ukranian type of drawn thread work and this large doily has 2 bands each measuring about 8cm, of the open style of this technique on each end. 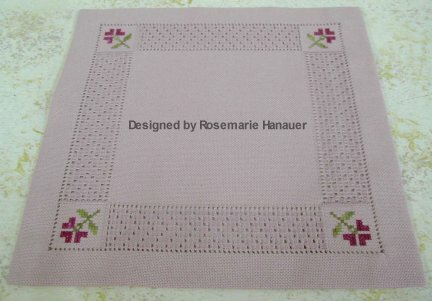 The pattern is made up of antique hem stitch and Myreska couched filling stitch both are easy to work but create this lovely lacy effect. An exotic multi coloured bird sits on a Traditional Crewel work branch. Worked in Gumnut Yarns 'Blossoms' hand dyed crewel wool, using an array of crewel work stitches including long and short shading. 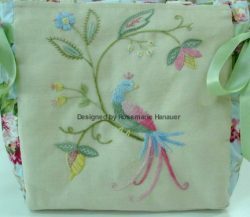 The bag is designed as a place to carry and store your needlework and all the requirements, with a inbuilt needle book and lots of pockets. 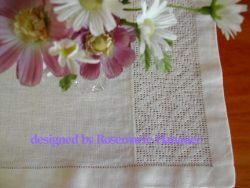 The panel can also be used as a cushion front, the design is worked on to Crewel linen twill and measures 30 cm square. Coming up starting October 8th we will be teaching a Hardanger bell pull with different filling stitches and a stumpwork piece using Gumnut Stars worked on Noil silk.